Security cameras commercial for your residence OR business in McDonough, GA.
Commercial security cameras are more commonplace today than ever before. Big or small, analog or wireless, business and homeowners alike are cashing in on the market filled with competition and tech advances. Do you have a detached garage you want on the same circuit of cameras? There’s a solution for that. Do you have a business that’s growing, where you know you’ll need to as much as double your cameras by the end of the next calendar year? There’s a solution for that, too. Security cameras are commercially built today, and for lower prices than ever. Where proprietors were once tempted to incorporate home-baked tech fixes alongside what commercial systems they were able to afford, today, the most robust systems can be harnessed by property owners of every need and budget. Here’s the thing: if you want flexibility and adaptability in your security system (which is only natural if you’re ready to make the investment), viable security cameras (commercial) for your residence or business in McDonough, GA are waiting for you on the other side of a professional consultation. The best bet to getting the camera system right for your property is a consultation with a professional here in McDonough. Don’t waste your time calling into a national customer service sales line, parsing through the call scripts to try and glean what you can from the sales garble. Start with a conversation with a local, a neighbor—a professional with years of business in your area. During your consultation, be sure to ask about hybrid systems, particularly if you think you’ll have a need to expand your security coverage or if you already have a need for indoor and outdoor surveillance. 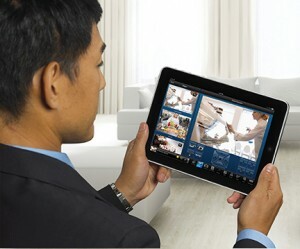 Hybrid systems are where analog (wired) and IP (wireless) cameras can co-exist. Also, be sure to ask about your property and its unique architecture. Have you identified the areas of risk for break-in? For accident or liability monitoring? How about conditions monitoring? Ask about integration of multiple alarms, too, including fire alarms alongside burglar alarms and surveillance. And, above all else, be sure you know what the installation process is with any company you talk to. Is an independent contractor sent out? Or do you get to deal with the company and its immediate representatives? If you want the local attention, installation, and on-site access to maintenance that a local security provider brings, talk to us at Advanced Security and Fire. We’re a locally-owned and operated McDonough, GA business with a decade of expertise in the area. Established in January 2008, we’ve helped thousands of clients select the quality products and systems that give our community the peace of mind we deserve. With our top-rated customer service, you’ll never have to parse through those call scripts, either. We’re here for you, our neighbors, to raise the bar of security in the McDonough area.